This story was updated at 1:25 p.m. EST. The planned March 9 launch of an unmanned European supply ship to the International Space Station has been delayed due to minor cargo packing issues discovered during a pre-flight inspection, officials announced today (March 2). Europe's third Automated Transfer Vehicle (ATV-3) was slated to launch aboard an Ariane 5 rocket from Kourou, French Guiana late next week, but during a routine check, flight engineers noticed that some of the cargo onboard was not properly stowed, spokespeople at the European Space Agency said. "Two cargo bags appeared to not be properly strapped in the casing," ESA officials told SPACE.com. "During photographic inspection, we saw that these two bags were not correctly in their strapped positions, so the fear was that during liftoff, these bags could move or fall. To avoid this, we decided to move the ATV back to the integration room, so this will take a few days of work." The ATV-3 has a total mass of about 20 tons and is packed full of supplies and propellant for the International Space Station. The cylindrical spacecraft is 35 feet (10.7 meters) long and 14.7 feet (4.5 meters) wide. It is large enough to fit a double-decker bus inside. The ATV-3 is named Edoardo Amaldi after the Italian physicist and spaceflight pioneer. ESA officials said the cargo stowage work on ATV-3 is expected to take about five or six days, and while a new launch date has not yet been set, officials expect to make an announcement by Monday (March 5). "It's nothing serious at all, it's just work that takes time to fix," officials said. The cargo freighter is designed to make an automated docking to the Russian Zvezda module on the orbiting complex. It then remains attached to the space station for up to six months before it is packed with garbage and deliberately sent to burn up as it re-enters Earth's atmosphere. Europe's ATV cargo ships are part of an international fleet of disposable robotic spacecraft that are used to transport supplies to the space station. Each ATV is named after a historical figure related to space exploration or science. The first ATV, dubbed Jules Verne, launched in 2008. The ATV-2 Johannes Kepler launched in 2011. Russia's robotic Progress vehicles and Japan's H-2 Transfer Vehicles also make routine trips to the orbiting outpost. 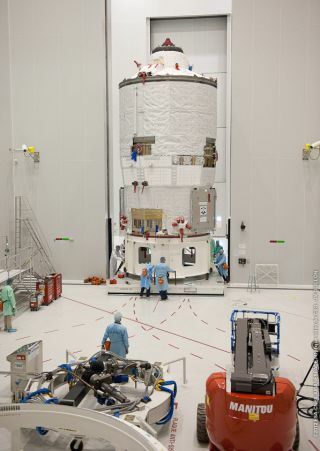 The next two ATV spacecraft, named ATV-4 Albert Einstein and ATV-5 Georges Lemaître, are slated to launch in 2013 and 2014, respectively. This report was updated to correctly reflect the mass of the European ATV-3 vehicle.